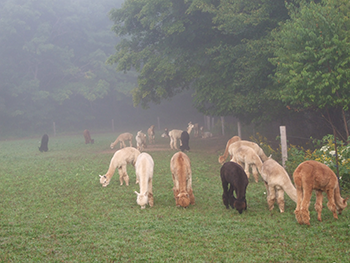 The process of selecting alpaca farming was actually a simple one. After retiring to the country, we decided to have a few animals, making our dream property a hobby farm. We also wished to grow and raise most of our own food. We bought a calf from George, a local farmer. His first sage advice was ‘Now Denise don’t get attached to him, just call him Steak.’ Steak looked lonely by himself so we soon added Hamburger, as a buddy. To make a long story short, after hand raising and nursing these two babies, we thoroughly enjoyed their antics. How could we send our pets to the slaughter house? So much for the idea of raising cattle. Obviously, we had to find an animal that had its value in something other than meat, hence the alpaca. Alpacas are quiet, gentle and easy to handle. They require little to no prior knowledge of farming. Raised for their fibre, they are ideal for the animal lover. This peaceful animal has a very interesting social behaviour. As animals go, dogs bark, cats meow, cows moo, but alpacas hum. Their gentle hum can be heard as you enter their pen. Curious in nature, they will peacefully approach visitors, particularly children. It is not unusual to sit in the middle of the pen and be surrounded by them. Although they don’t love to be petted, they do enjoy interacting with others. 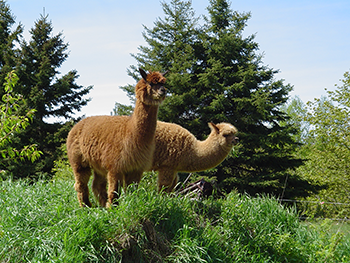 It quickly became very obvious that this was the animal for us: an animal raised for its cashmere-like fibre, peaceful in nature, requiring a small acreage (8 alpacas to an acre), eating small amounts of food, little vet involvement, adapted to our climate. What a great animal to own! 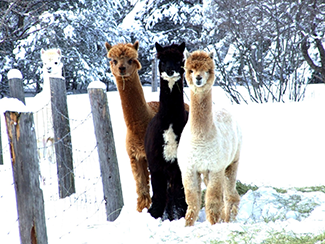 During the winter months, alpacas develop a full fleece giving them the appearance of teddy bears. They come in 22 natural colours, a desirable asset in the fashion industry. This lustrous fibre is highly sought after for high-end garments. Shearing? The pivotal point? you ask. Pivotal point for what? 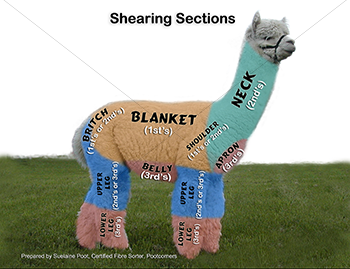 Shearing is the pivotal point of the alpaca industry, no matter what your focus, be it breeding or fibre. Firstly, let us clarify the differences between the focus on breeding and the focus on fibre. They are not as distinct as they seem. Every livestock industry needs the breeding farms. The breeder continuously strives toward the improvement of the end product. In this case, the end product is the alpaca with its wonderful fibre. The breeder wants animals with the presence and a look that spell quality at first glance. He/She wants to increase density, uniformity and fineness, and wants to maintain these features over several years of the lifetime of the alpaca. All of this can only be accomplished on a healthy animal, so well balanced conformation and good health are also important factors. The fibre producer wants to produce quality fibre in order to provide for the development of a quality end product, attractive enough that the consumer will be willing to pay a premium price. He/She also needs to produce as much as possible on each mouth they feed in order to be cost efficient. In other words, for the fibre producer to make a profit and be sustainable, he must have animals that produce dense, uniform, fine fibre and do so for several years of their lifetime. He also wants to maximize the size of his herd without spending large sums of money on veterinary care; therefore, good health is crucial. As you can see, the differences between the objectives of the breeder and those of the producer are not so far apart. Now that we have established that fibre production is key in the alpaca industry for both the breeder and the producer, let’s focus on the fibre….and that leads us to the most important period of the year…..shearing! For some, this is evidence of great genetics and breeding practices, for others this is the culmination of a year’s growth. For both, it is the harvest; directly or indirectly, this is where the profits are generated, hence, the title of this article. 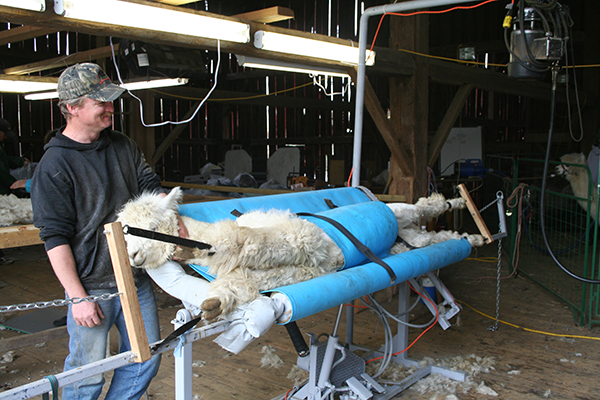 Shearing is the pivotal point of this industry and we must give it the attention it deserves. 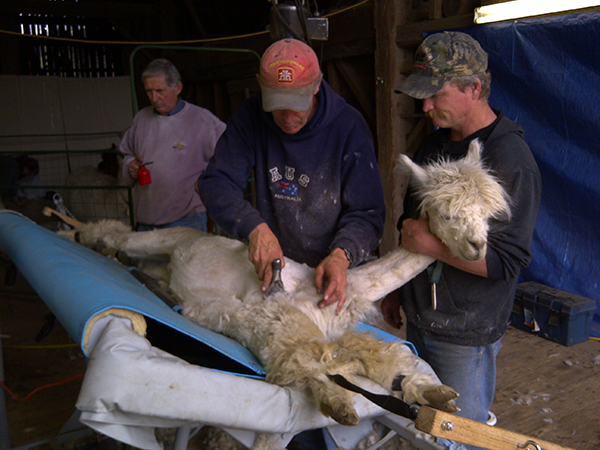 Shearing practices may vary a great deal, from one farm or ranch to another and from one shearer to another, but certain factors must be considered during all stages: the preparation, the actual shearing and the follow-up with the fleece. This part of alpaca farming relies heavily on teamwork and each member of the team plays a crucial role in assuring a profitable harvest. You are purchasing your first alpaca. Preparation for shearing begins now. 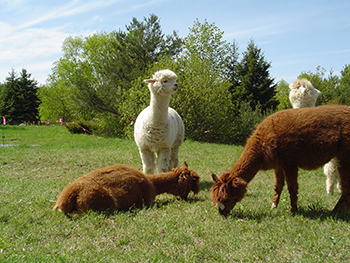 Whether you just want to breed or you want to get into the fibre industry, you must consider the genetics and qualities of the fibre of your alpaca. Then you must look at housing and feeding. You want to keep that fleece as clean as possible for shearing day. This means considering what bedding to use, what feed to use for good nutrition/health and what husbandry practices will keep the environment from contaminating the fleece. Shortly after cria are born, do you want to consider shearing the tips of their velcro-like fibre? 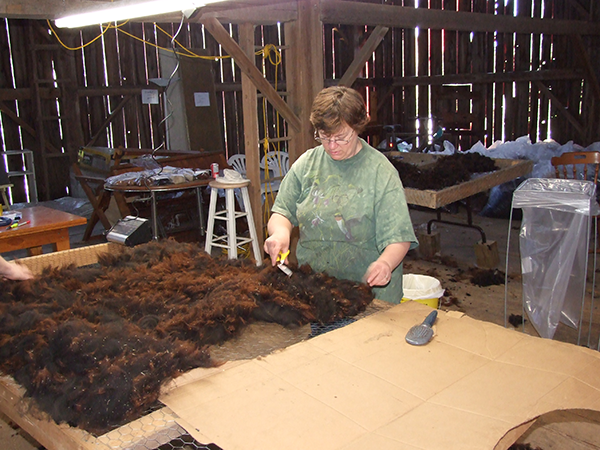 As shearing time approaches, efforts must be focused on the condition of the fleeces and steps that must be taken to assure the cleanest possible coats. Take my word for it. It is much easier to clean the coat while it is still attached. Do your alpacas live on nice green pastures where there is little dust, dirt or vegetation that can become embedded in their fleeces? If not, consider a livestock blower to be an essential tool on shearing day. This will rid the coat of most dust and dirt. The benefits are three-fold: your shearer will be much happier as it will save much wear and tear on his blades as well as precious time sharpening them; the mill will be happier with the clean fleeces arriving for processing; and you will be happier as you will not have to pay additional costs for the added weight and extra cleaning at the mill. Everyone wins! Preparation for shearing day also means getting organized ahead of time. Have all of the equipment and supplies ready for the shearing. This includes any husbandry items that may be needed. Are you planning on doing teeth, toes and shots? First aid kits are a necessity for both alpacas and humans. And, remember, it’s all about the fibre. Do you have a good skirting table, and appropriate storage bags as well as an efficient labeling system? Don’t forget to keep accurate records through the whole ”before, during and after” process as these will influence processing decisions and future breeding practices. Do you have a quick and efficient way of getting the animals to the shearing shed? Most importantly, the animals must be dry for shearing. If it is going to rain, be sure to keep the alpacas indoors. And of course, planning meals and beverages for the members of your shearing team are key. Despite the task at hand, the friendship and collegiality that come of the teamwork of shearing day are food for memories that will last well beyond the trials and tribulations of the day. Some things to consider as you prepare for the big event. This is particularly true for the fibre producer. When getting organized for your shearing, cost of production is an important consideration for your planning and should be included in your business plan. Among other things, consider the cost of shearing per animal. Does your shearer charge by the animal or by the hour? Are you obliged to hire helpers paid by the hour? I hate to use a cliché, but time is money. If you are focused on producing, then you have or will have a substantial number of animals. 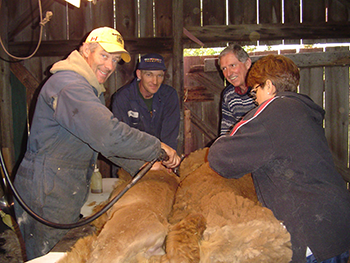 Efficiency on shearing day is a key element in the costs of shearing and perhaps in the willingness of your helpers to participate from year to year. How can you speed up the process without causing undue stress? What husbandry tasks can be accomplished another day? Your shearer must make his trip and time cost-effective also. Can you negotiate a mutually satisfactory method of payment? If the shearing is based on an hourly rate, you are motivated to organize an efficient method of working and the shearer commits to being quick but still maintaining quality. Or perhaps the fee is based per animal with the understanding that the breeder/producer will make every effort to use the shearer’s time wisely. Shearing day/time arrives. All is ready. The equipment is laid out. The alpacas are dry. The team is ready and the food is in the fridge. It is impossible to go through all of the details in this article, but I would like to focus on the most important tasks of this part of alpaca farming. To this point, the alpacas have been kept as clean as possible. The crias’ velcro coats have been picked out to remove embedded vegetation. It is important to discuss shearing with the shearer. How and what comes off of the animal? How will the sections be divided? Where will they go when they come off the table? Who is working the skirting table? Fleeces must be clean. Blowing the dust and dirt out of each coat is strongly recommended. The blanket fleece should be placed on the skirting table in the shape of the animal and all guard hair or stronger fibres should be separated from the main blanket. All second cuts and remaining dirt or debris must be shaken out. The fleece can then be bagged and labeled. Seconds consist of thigh and leg areas; these should also be shaken to discard second cuts and other contamination. All guard hair and fibres less than 1 1/2” should be discarded. A finer grade of seconds should be bagged in consistent lengths – within a variance of 1 ½ “. These may be used as yarns if properly prepared. In some cases, seconds may need to be divided into 2 bags. A third bag would keep the neck together. Again, all second cuts should be shaken out before bagging. The apron on a young animal may have a function. On an older animal, it is usually full of guard hair and unusable. The skirters may not have time to prepare the fleece for each bag properly before the next fleece arrives on the table. Efforts can be concentrated on: 1) shaking out the second cuts, as these will stick to the fleece and will be much more difficult to remove after storage in a bag; and 2)separating the sections into different bags. The blanket fleece should be rolled carefully so that skirting can follow the outer edges when spread on a skirting table. 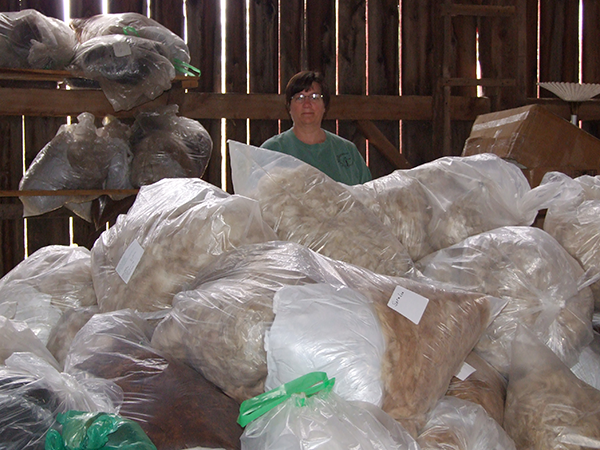 Fleeces that are stored all together in one or two bags are almost impossible to separate adequately at a later date and take far too long to do so. Remember the old adage “Time is money”. It is helpful to combine all of the bags of one alpaca into a single large bag with the animal’s name and shearing date clearly indicated on the bag. If time allows, records may be kept during this process. It may be easier to do so during the next phase. After shearing, the breeder/producer will wish to prepare these many precious bags for processing. Proper preparation is paramount, not only to the success of the desired end product, but for the success of the alpaca industry as a whole. After all, poorly prepared and poorly processed alpaca fibre sold to customers as the ultimate in luxury, hurts all of us! This is the point where proper skirting, cleaning and basic sorting need to be completed. If a certified/experienced grader is available, the fibre may be batched according to colours, grades and length. Decisions can then be made as to appropriate end product for the various grades. This must be done thoughtfully. Which would you prefer around your neck, a fine lacy scarf knit in grade 1 or grade 6? What about socks? Wouldn’t socks knit in grade1 or 2 feel wonderful on your feet? Yes they would, but you wouldn’t be pleased if they wore through after you had worn them only a very few times. What about blends? Silk, bamboo, merino, sea cell, soy silk, nylon. There is a myriad of products out there that add important characteristics when blended with the alpaca. But which one to choose for which circumstance? How much…10%? 20%? The choice of mills to work with needs to be considered before this step, as batching considerations must be made in light of the capabilities of the machinery being used. Some mills can accept lengths of 2” for spinning. Others have a minimum of 3”. What maximum length is acceptable? What blends do they work with? What other services do they provide? Do they dye yarns and/or rovings? What instructions will you give them? What size is the minimum batch? There are many questions to be asked before making these decisions. Then there are considerations about the marketplace. After all, all of these efforts really have only one goal: the sale of alpaca products. Where and how will you sell these products? Who are the intended customers? What do you think they will be willing to purchase? How will you price the articles so that they will sell, but so you will generate the profits to continue producing alpaca fibre? 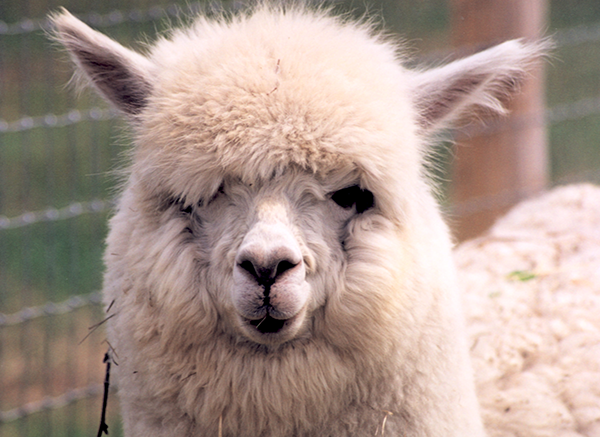 Not all alpaca yarn and products are created equal. Preparing alpaca is an art and a science. Having a good quality end product is the result of much learning and years of practice… like anything else that is worth mastering. All producers need a basic knowledge of good fibre preparation, but then can access the skills of a qualified grader/sorter to help in final preparations for the mill. Why is proper fibre preparation essential to a quality end product? 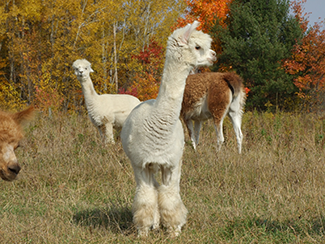 Alpacas generally have a very good coverage of fibre on their whole body, however the fineness of the fibre is not equal on all parts of the body. The finest fibre is on the blanket—back and sides of the alpaca. Think of a saddle blanket extended. The upper legs become coarser and, over time, begin to show more guard hair. The chest area, called the apron, generally has quite a bit of guard hair, which again, increases and becomes coarser as the animal ages. The neck fibre is usually about the same fineness as the blanket, but much shorter and so cannot be processed with the blanket. 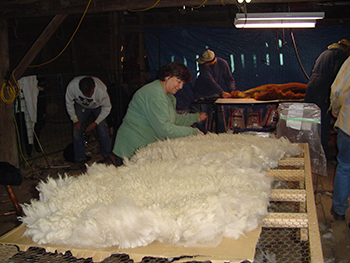 The result is, that at shearing time, these areas must be separated immediately in order to avoid contamination of the best quality fibre...that is the blanket. 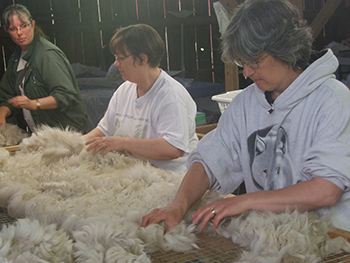 For each animal, we separate the fleece into four bags: the blanket, the neck, the legs or seconds and the apron. Each are combined into one bag and labeled with the animal’s name. The other issue important to deal with on shearing day is cleanliness. It is very important to send a “clean” fleece to the mill. One filled with vegetation, will still have vegetation when the yarn comes back. Too much vegetation will cause problems with the carding machines in processing and will likely be refused by the mill. We make every effort to clean the fleeces even before they are removed from the animals by blowing dust and dirt from their coats and removing the vegetation. How do we prepare these bags for the mill? Shearing day is a very busy day. We usually assemble a team of 6 to 8 helpers, so time is of the essence. The concentration is on “gettin’ ‘er done”, but in a way that facilitates the follow-up. After shearing day, when we have more time, we come back to the bags to prepare the batches for processing. The word of the day is “UNIFORMITY”. 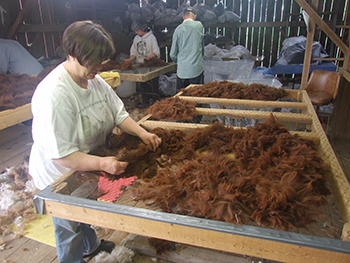 The batches must contain “like” fineness, and same length fibre, as well as similar colour. In Canada, we separate alpaca fibre according to 6 different grades, with Grade 1 being the finest fibre, usually the baby (or cria) and Grade 6 being the coarsest. We take the bags and go through them making sure the skirting was well done on shearing day, and we haven’t missed any guard hair that should have been removed, then batching them according to grades and length. We then determine what would be the best end product for each batch and place the instructions into each bag for the processing mill. Most alpaca fibre can be used for something, but it is important to determine which fibre is best for which end product. All of this information is also recorded on the computer for future reference. 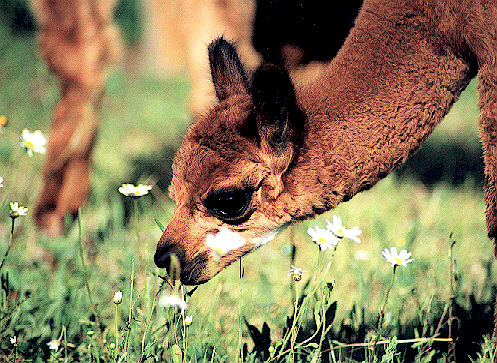 What factors are important to quality alpaca products? · Also selecting blends that combine the best characteristics of alpaca fibre with complementary traits of other fibres such as fine merino, silk, bamboo and others. These selections are also made keeping in mind the end product. The alpaca farmer has lived up to his/her responsibility, now it is up to the processor! 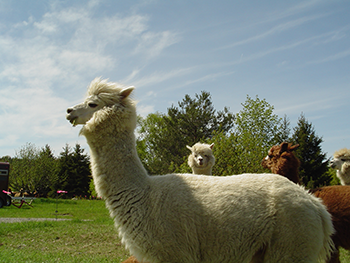 There are so many advantages to raising alpacas, that it is very difficult to list and explain them in just a few pages. 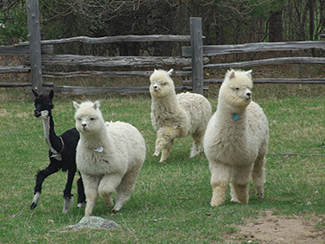 We will attempt to give you a general idea of some of the financial and health benefits of owning your own alpaca herd. We all know the advantages of placing your money at a bank. It pays interest, albeit at a very low rate in recent years. 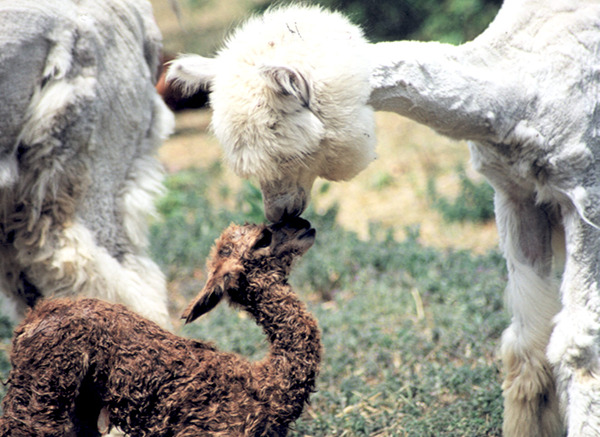 With alpacas, you have the potential of earning your initial investment every time a cria (baby alpaca) is born. Where else can you double your money so quickly? 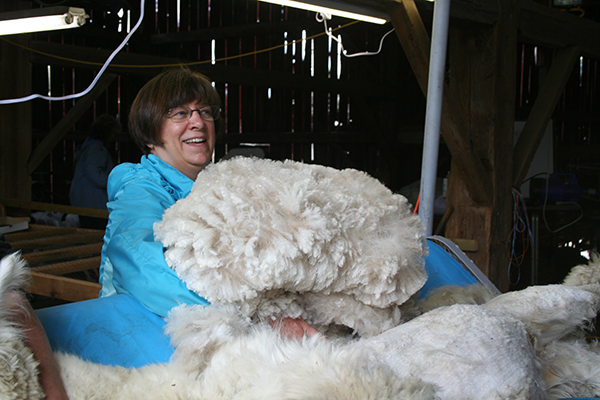 “It’s all about the fibre”... soft, luxurious, warm fibre that the animals produce for you every spring. You can sell the fibre outright or you can retail it from your home. The latter is much more profitable as you can sell yarn, socks, felt, etc. This method of sale can bring you more than $60.00 a pound. Imagine three, four hundred pounds of fibre … a nice, tidy profit. 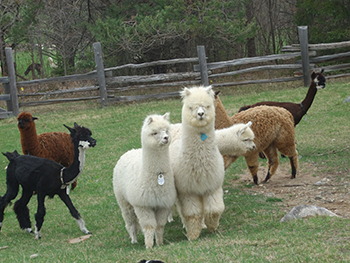 Alpaca farming or ranching permits you to declare your property as a farm. This allows you to use most of your spending as a deduction against your normal income. For example, if you buy a computer for the home office, it is tax deductible. Consider using renovations or construction of a barn, your feed, vet bills, travel expenses, repairs, insurance, purchase of a new truck and so much more. Under the 1998 legislation in Ontario, a farmer pays 25% of the municipal tax rate on farm property. What an advantage! To qualify for these benefits you must have a farm business registration number and you must generate an annual gross revenue of $7,000.00. Both are easily attainable. What about Provincial Sales Tax and the Goods and Services Tax that are now rolled into the HST (the Harmonized Sales Tax)? Yes, with your farm registration number you can be refunded on most products purchased for the farm. How to finance your purchase of animals is an often asked question. Some possibilities include applying to Farm Credit Canada for great loan options geared to farmers, converting other assets into liquid money, using real estate equity, having a line of credit for investment purposes or making arrangements with the breeder. All interest paid is tax deductible. Can alpaca farming/ranching be considered an investment in your health? In today’s workplace, more often than not, we work long hours at high stress levels and we fight frustrating commutes and heavy traffic to get there. Can this be detrimental to your health? Many studies warn us of the multiple problems often caused by stress and/or lifestyle. Consider the calming effects of walking out into green pastures and being greeted by the gentle hum of alpacas. Or perhaps the commute to a barn, rather than through heavy traffic appeals to you? What of the fresh country air as compared to the recycled stagnant air of the office? Then there is the possibility of dealing with the minor problems of the alpacas as opposed to irate co-workers or clients. We experienced the detrimental effects of stress in the workplace first hand. It became essential to make a lifestyle transition. Our decision has resulted in better health and fitness for both of us. Since leaving my high school principal’s position, I have enjoyed the benefits of losing 15 pounds and becoming much more fit. My wife has also made the transition from her job to country living. She, too, enjoys working with our country friends ... 95 alpacas, 1 cow, 4 sheep, and 30 chickens. Oh, and we must not forget the healthy organic foods out of our garden. Country living is an investment in our health!